Uber’s rollout in Asia is gathering pace after the US-based private hire car service last week marked its official launch in Seoul (Korea) and Taipei (Taiwan) following the conclusion of six-week testing periods in both cities. These two launches take the company to three locations in Asia — leading on from its first foray into the region via Singapore in February — but, as the firm seeks out larger markets, it is only a matter of time until it finds its toughest challenge yet: China. Uber says its plans for Asia run deep. In an interview with TNW in Taipei last week, Head of Operations Ryan Graves told us that the company is looking at a number of markets next, including Hong Kong and China. Uber, as we well know, is not one to shy away from a fight. That comes with the territory, since trying to disrupt the long-established taxi cartels and industries that exist in each town or city is at times a task of Herculean proportions. Speaking at the F.ounders 2013 event in March, Uber CEO Travis Kalanick said the company is fighting various legal issues in the US, including regulators that he claims are trying to preserve the ‘status quo’ and, what he calls, outright ‘corruption’. The company has battled authorities and laws in a number of cities with some successes. In particular, it reached an agreement with regulators in California after protracted issues, while it gained the backing of FCC Chairman Julius Genachowski in Washington D.C., going on to land a deal with legislators to keep its cars on the road in the US capital. Things have progressed from times when the city of San Francisco threatened Uber with 90 days in jail for every ride offered, but its struggle in Denver, Colorado, where it faces renewed calls for its closure, shows that there is still much to be done on home soil. Uber has been able to make progress in the US for a few reasons, including the fact that it is a promising young US company that is well backed, having raised nearly $60 million via a roster of well known investors. Equally, it has been in a position where it can dispute legal systems and work with regulators to drive progress. These factors will amount to naught in China, however. Uber has a number of challenges to overcome in China, which primarily includes establishing a team in Beijing and/or Shanghai. As a foreign company starting from scratch, its staff are all it has, initially, so it will need to hire clued-up and connected folks who take away its foreignness and help it behave like a Chinese company. Indeed. Groupon’s failure to hire local staff in the right management positions serves as a reminder of the importance of hiring the right team in China. Then there is the issue of competition. China is a thriving market and, as the likes of private social network Path are well aware, imitation is the sincerest most common form of flattery in the country. In the same way that Path replicas cropped up across China, so the country has its own versions of Uber each battling to establish itself. As Quartz recently pointed out, the market for taxi services has never been bigger in Chinese cities. A combination of factors that include an increasingly affluent middle class have made hailing a taxi a challenging sport, and an area ripe for disruption with taxi-hailing applications. Other apps exist too — including Kuaidi Dache and Dache Xiaomi — and it’s also notable that Internet big guns have invested money into some of these services. E-commerce giant Alibaba invested an estimated $1 million in Kuaidi Dache in April, while car rental firm Yonchi — which runs Dache Xiaomi — was said to have landed a round in the ‘tens of millions of dollars’ bracket. This growth has attracted the interest of authorities — as it did in the US — but, as with many things in China, the reaction from officials is difficult to predict and, at times, it threatens to be highly restrictive. 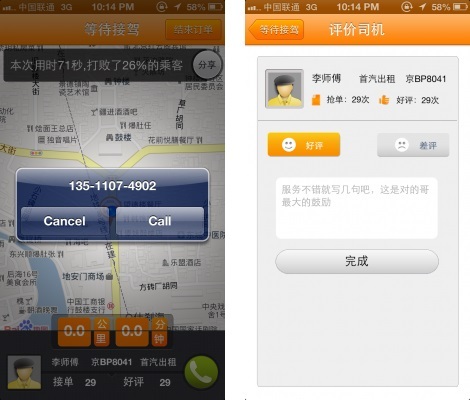 For example, Beijing is gathering all third-party taxi-finding apps under a unified platform, tying them to one of the city’s officially-recognized platforms. Officials have deemed ‘pick-up’ fees, the premium charges that users can offer to pay to get picked up before others, to be illegal. It’s a similar story outside of the capital. Shenzhen cracked down on taxi-finding services in May, while authorities in Shanghai also reiterated that it is illegal for drivers to charge premiums through apps; the city is said to be working to draft is own regulations that will cover taxi-finding apps. The company has never ducked confrontation but China, where it has no presence and will be reliant on new hires, is proving to be a difficult market for even the more established taxi apps. That makes it an even tougher place for Uber, which will start with nothing. How will authorities view Uber’s surge charges — which see premium prices come into play when demand is high — and can Uber differentiate itself from the rest? In our interview last week, Graves said that Uber is positioning itself as a more premium option in Asia, where taxi prices are “crazy cheap,” and that’s almost certain to be the same for China. But then there’s the politics. Kalanick might well find a new meaning for the word corruption in China, if things get tough at a local level and Uber runs in to opposition. On the subject of regulations in the country, Graves says that Uber is “working diligently to understand some of those challenges”. “We know that there are transportation challenges in that market to be solved, but we know that we can solve them,” he added. Can Uber succeed? Since it depends on so many factors, it’s impossible to say with any authority, but heeding the lessons of failure from the like of Groupon will certainly help. It’s going to be an interesting and new kind of challenge, for sure.